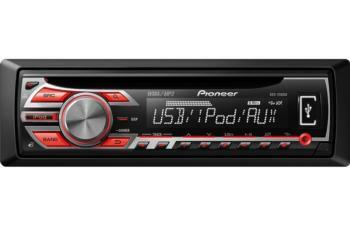 This Pioneer's MOSFET amplifier uses special transistors to deliver plenty of usable "real world" power — more than most factory car radios — so you'll enjoy crisp and clear sound even at highway speeds. And to tweak your tunes, you'll love the extra control afforded by the 5-band equalizer, 3-level loudness, and built-in frequency filters. Pioneer's Advanced Sound Retriever reverses the compression process to add back some of the sonic info that's lost in the digital conversion. You'll notice a nice improvement in the sound quality of your MP3 and WMA music, whether it's stored on an iPod, a disc, or a thumb drive.